We realize that we are not the only dealer of fossils on the net so it is important that you deal with a reputable, knowledgeable company that will be around for many years to come. Shop around on the net for fossils and I am sure you will come across some that are described as being the rarest, best or finest with prices leading you to believe those claims are true. We will always be more than fair and HONEST in the pricing of our fossils and shark jaws and feel certain that you will think so too. 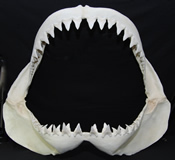 In addition to collector quality fossils, shark jaws and shark teeth, we also offer some items to wholesale buyers. Our polished items which include mammoth tooth slices, fossil clams and whale teeth are very popular. Check our catalogs for example of each and contact us for pricing. 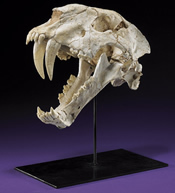 We are always buying fossils and shark jaws, but don't always put them on the website. If there is something in particular that you are looking for, please let us know. Through our network of fossil collectors in the field, divers and other dealers, we may be able to find what you are looking for. Look around then give us a try. We are certain you will be very pleased with your experience. Come on in and enjoy the site!